Hot Aisle/Cold Aisle remains a common consideration for data center architects, engineers, and end users. But how much cooling capacity can it really support? The answer depends on a number of architectural considerations. A number of users have found, however; the approach to be impractical at higher densities, which require high airflow. Bypass air flow problems can cause servers that don’t get sufficient intake air to pull their own exhaust and potentially overheat. And as energy costs continue to rise, the practice of producing and driving larger volumes of cold air to compensate for these hotspots is wildly inefficient. The high density installations of blade servers are causing hot spots and cooling these blades is a significant airflow distribution problem. One of the most recommended best practice solutions to resolve this problem is containment-the complete separation of the air paths on the data center floor. Hot Aisle Containment, for this reason, succeeds as an efficiency strategy. Server exhaust air, so often the culprit in conventional cooling, is removed from the room at large. Users can then focus cooling strictly to the rack or row. What is Hot Aisle Containment? Most IT equipment breathes front to rear. Hot aisle/cold aisle aligns the cabinets in rows around this concept, with the server exhausts of each row facing one another, becoming the hot aisle. Hot Aisle Containment immediately captures server exhaust air and restricts its entry to the rest of the data center. The exhaust air’s destination depends on the containment configuration. Depending on the manufacturer, these solutions may or may not include fans to propel the air out of the cabinet and in to the false ceiling. One version of hot aisle containment turns the hot aisle into its own room. Once cabinets are aligned in the traditional hot aisle/cold aisle layout, the hot aisle is sealed with doors, sidewalls, and roofs.From there, an In-Row air conditioner takes over. This unit, more compact, is embedded within a row of enclosures. It captures exhaust air off the equipment, conditions it, and returns it to the cold aisle. This approach involves a specialized cabinet with a solid rear door and attachments for ductwork (also called a chimney) and a false ceiling. Attached to the rear of the server cabinets, these ducts catch the exhaust air off the servers and channel it into a false ceiling.The false ceiling serves as a plenum, delivering the hot exhaust air to a perimeter-mounted air conditioner, which may also extend, via ducts, to the ceiling level. With exhaust air out of the equation, the servers are assured a consistent inlet temperature and delta T. As a result, the system can successfully support higher density installations with more predictable cooling capacity. Manufacturers of both room containment and chimney solutions claim 30kW per rack is achievable with their designs. Air conditioner capacities vary based on operating conditions. A 20 ton unit, if it receives warm return air, may only offer 11 tons of sensible cooling capacity. Conversely, its capacity may exceed 20 tons if receives hotter air and uses more of the cooling coil. Within hot aisle containment, the In-Row air conditioner immediately captures exhaust air from the server cabinet, conditions it, and returns it to the hot aisle. The short distance ensures that the air conditioner and its cooling coil receive the exhaust air at its warmest point. With hot aisle/cold aisle, exhaust air has to travel varying distances to ACUs positioned throughout the perimeter of the room. The chimney version of hot aisle containment assures that the AC unit receives warmer air, but the hot air capture is not immediate. The exhaust air must move through the drop ceiling and into the intake of the room-based AC unit. In the traditional layout, fans must move the air from the perimeter of the room, under the raised floor, and through a perforated floor tile into the server intake. 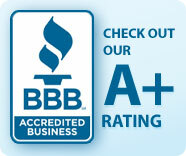 This process, of course, requires energy, which varies from facility to facility. Often impediments (large cable bundles, conduits) exist under the raised floor, which require additional fan energy to move the required volume of cold air. The “room” version of hot aisle containment reduces fan energy by proximity. The AC unit is embedded within the row of cabinets, ensuring the air does not have far to go. In addition, the AC delivers air directly to the row; there are no under floor impediments to overcome. The fan energy requirement is more complex with the ducted version. If cabinets are arranged in the traditional layout, air still must move from the perimeter of the room to the cold aisle, making it subject to the impediments mentioned earlier. And, depending on the manufacturer, fans may be required to move the exhaust air from the cabinet and into the drop ceiling. Proponents of this design, when comparing it to Cold Aisle Containment, often discuss the overall data center temperature. 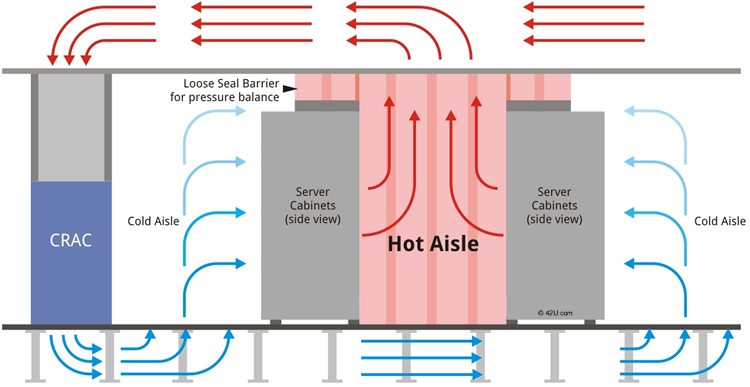 Cold Aisle Containment isolates temperatures at the server intake, meaning the rest of the room is subject to server exhaust temperatures. Hot aisle containment isolates temperatures at the server exhaust while the rest of the room feels akin to the server intake temperature. The result: a more palatable overall temperature for those working in and passing through the data center. The In-Row air conditioner functions like a traditional CRAH in a smaller footprint; it brings to the cooling directly to the row or rack level. Like its counterpart, it requires a chilled water connection. Existing facilities must consider the feasibility of bringing chilled water to the desired location for the AC unit. If the chilled water infrastructure consists of hard or copper piping, how complex is the addition of new piping lines? How does it fit into the broader cooling architecture? Will it necessitate downtime or can it be deployed within a live environment?At the row level, will existing cabinet rows need to be rearranged to incorporate the AC? Will it work with existing cabinets or require new ones, meaning equipment has to be removed and re-racked? At the room level, existing facilities must first have a drop ceiling with a logical return air path to the air conditioner intake. From there, users need to consider compatibility with the existing parts and pieces. Is the ceiling and/or false ceiling height compatible with the ductwork? Would the chimney installation interfere with existing ladder rack, cable runs, or power drops? What modifications are necessary to existing cabinets to install the ductwork? Are the ducts only compatible with proprietary cabinet solutions? How complex is the overall installation in a production data center? Greenfield facilities can plan for everything during the design phase. For legacy sites, the concerns above may or may not be deal breakers. It becomes complicated when existing cabinets, rows, and infrastructure need to be reworked in a production environment. For users with suitable designs, Hot Aisle Containment offers marked efficiencies over conventional HVAC cooling. Certain In-Row air conditioners, used to contain the exhaust air, are equipped with variable speed fans, which align with the compute load. For fans, speed is directly related to energy consumption: If you can reduce fan speed by 10%, fan power consumption decreases by 27%. If you reduce fan speed by 20%, fan power drops by 49%” (Fontecchio, 2009). Instead of addressing an entire room, hot aisle containment (the room within a room) focuses cooling strictly on that load. Right-sizing instead of over or under-cooling will have a significant impact on the cooling portion of PUE. A hosting facility, using chimney-based containment, estimates they will save 25% to 30% in their annual energy bill, resulting in savings of $250,000 to $300,000 (McLawhorn, 2009). With server exhaust controlled, both flavors of containment allow for warmer temperature settings, which can permit more use of air-side and water-side economizers. Considering “data center managers can save 4 percent in energy costs for every degree of upward change in the set point” (Miller, 2007), the practice is good for the bottom line and good for the environment. The Green Grid sees an air management strategy as “the starting point when implementing a data center energy savings program.” Hot aisle containment succeeds as an efficiency strategy because of its far reaching effect on the entire data center from the inlet temperature, to the air conditioners, to the chiller plant.